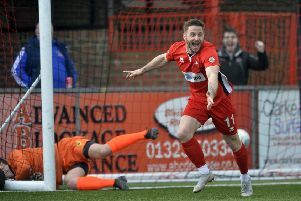 Eastbourne United boss Ryan Cooper believes his improving team have a chance of causing an upset as they welcome highflying Chichester to the Oval tomorrow. (Saturday, 3pm). United remain bottom of the Southern Combination Premier following their local derby loss to Langney while Chi are third. “Chichester are a very good side and things are going well for them,” said Cooper. But anyone can truly beat anyone and we’ll take a lot of confidence into the game from the draw against Pagham last week. “It is another good opportunity to get our first win of the season. I take pride in the fact that I’ll always fill the players with confidence and we won’t go into any game now expecting to lose, not with the players we have now.